It’s not everyone’s style, but when I enter races I prefer to turn up not knowing all the little details of what I’m undertaking. I feel that too much nervous anticipation can be to the detriment of the whole experience and I don’t care to research my opponents too much, preferring instead to concentrate of what I’m doing in a race rather than what they may or may not be getting up to. I don’t think of it as ‘winging it’ as such, more that I like to focus intently on the moment and I find this approach enables that. Too much research can cloud your judgement about things, such as whether you’re capable of winning, whether something is achievable or how hard something should be. That’s not to say I don’t prepare for things – I couldn’t turn up to a race without having done some training – just that I don’t like to get bogged down in the details. 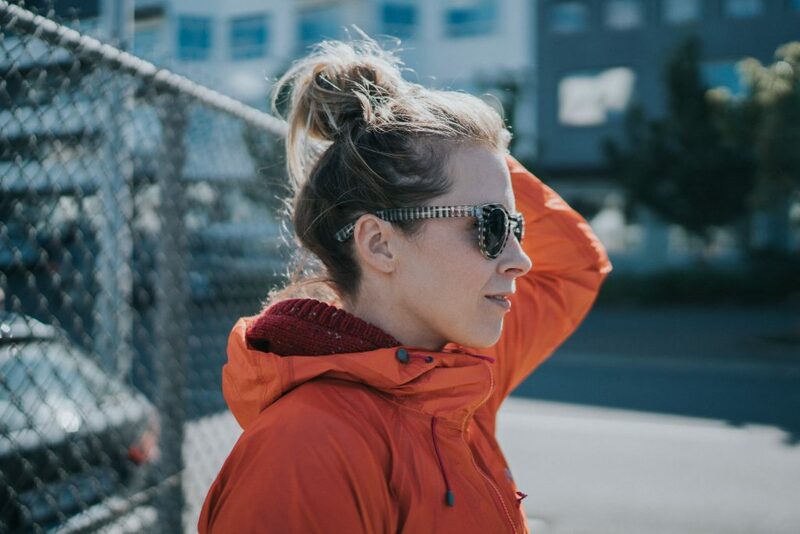 It was in this spirit that when Kym NonStop, a New Yorker who I’d met (briefly) through racing fixed gear crits such as Red Hook, asked me if I’d like to team up with her to do a three day mountain bike stage race, I readily agreed. We didn’t actually really know each other much but both kind of recognised a kindred soul in each other, one who’d be up for doing something a little wild and out of the ordinary without much thought for whether we’d be any good at it. So I didn’t research the event much – just a cursory glance at the website and I was in, with no worrying about how many hours we’d be riding or whether we’d get manage ok. 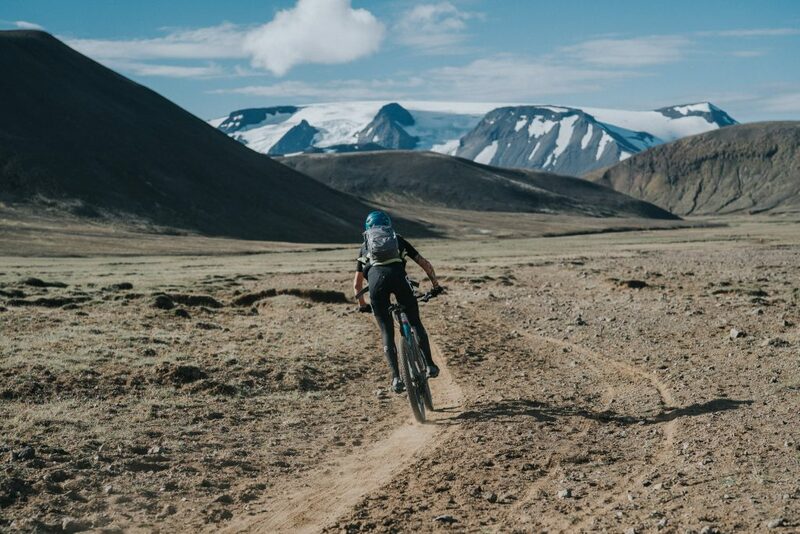 The race I agreed to enter was Glacier 360, a three day, 300km UCI accredited mountain bike marathon in Iceland that circumnavigates the Langjökull glacier in the remote and mainly inaccessible Highlands. 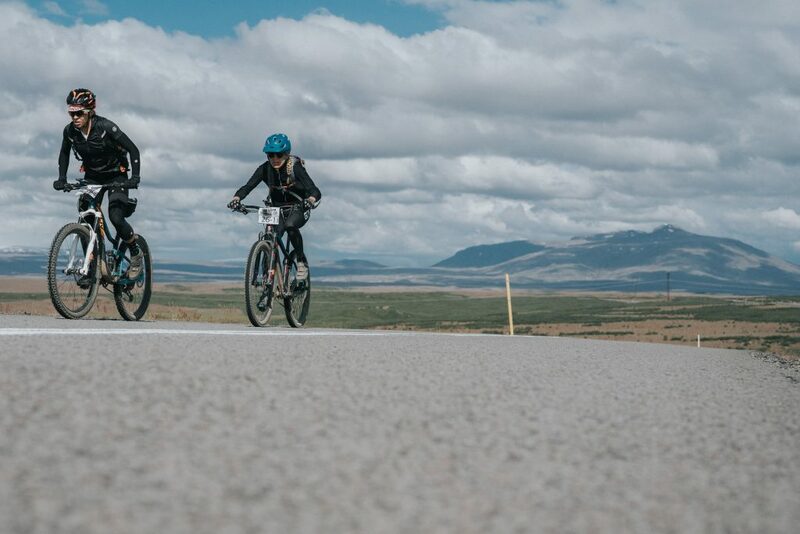 A day after flying in to the land of fire and ice, we lined up together at the start of the race in Geysir, full of excitement about what lay ahead. 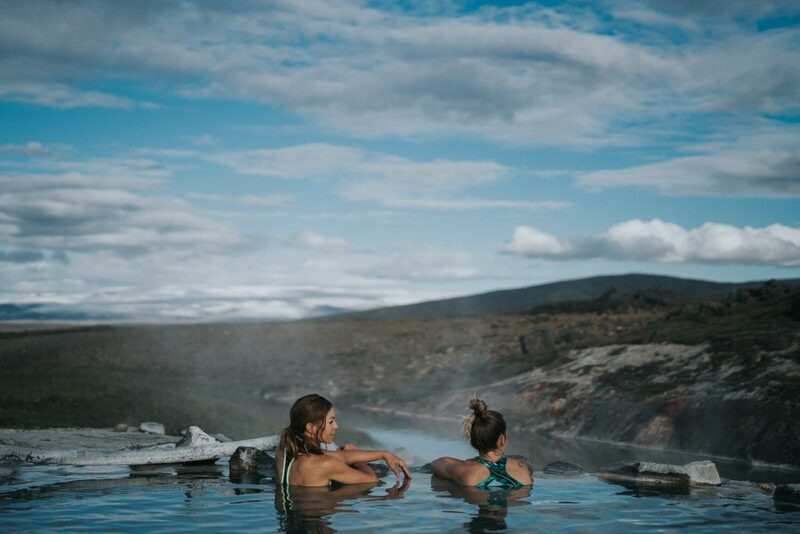 We were in what’s known as Iceland’s ‘Golden Circle,’ a part of the country that’s well known for its numerous natural wonders including stunning waterfalls, geysers, lakes and geothermal springs. 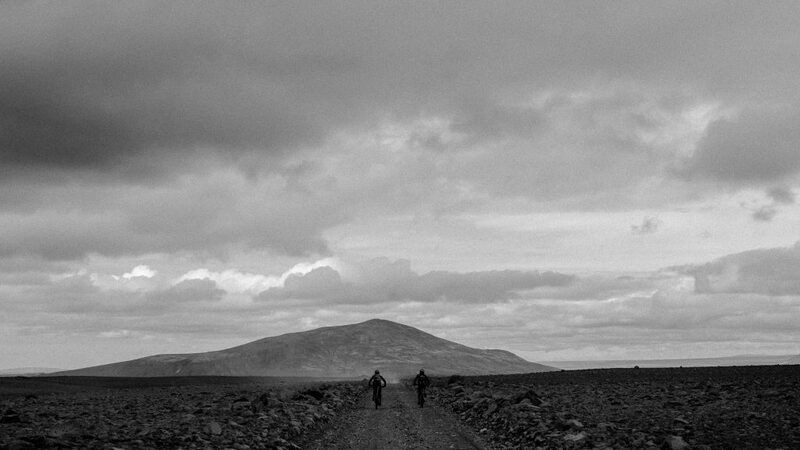 We were to ride into a protected area inaccessible by car and felt really privileged to able to do so. Having never done a long stage race before (I am currently focusing on crit racing (45 – 60mins) with some cyclocross (60mins) and cross country races (60 – 90mins) thrown in for good measure, I naively thought that people might go off steadily. How wrong I was. The minute we started everyone went hell for leather and not wanting to be left behind, Kym and I dug deep and sprinted up the first sand and gravel road. After climbing for five minutes we crested the hill and had our first glimpse of the huge glacier we’d be riding around, a vast shining mass of ice in the far distance. Twenty minutes later I was still in Heart Rate Zone 4, which is what I race crits in so I suggested that we should probably slow down a little! Our gravel trail passed past stout, coarse vegetation as we made our way over to the first significant climb, a series of zig zags up a relatively steep hill that popped us out on a more desolate looking plateau. 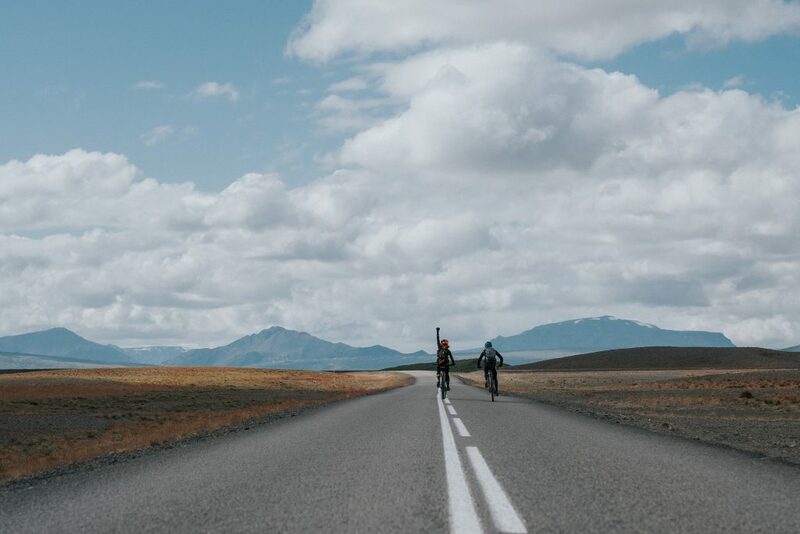 Having vowed to eat and drink plenty to get myself through the next 100km, I chowed down on an energy bar and settled into a steady rhythm, ticking off the kilometres whilst gazing around at the vast and remote wilderness we were passing through. 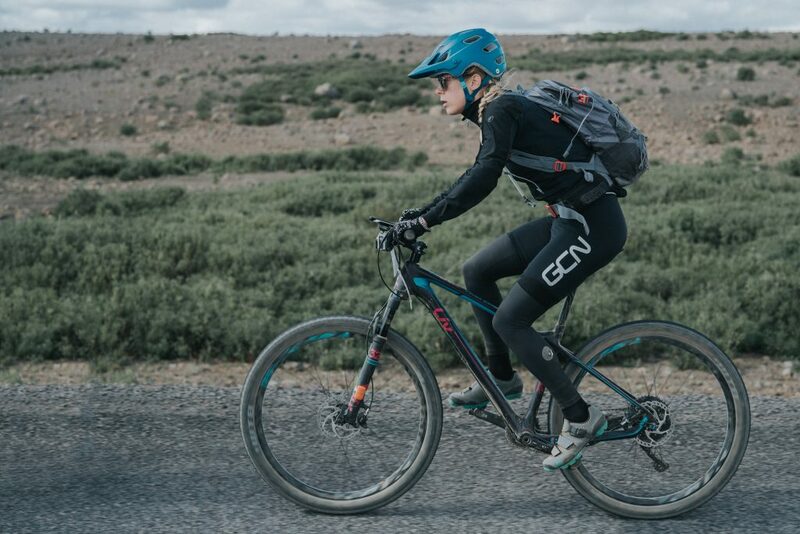 With mountain bike rides/races, I’m sometimes amazed by how little distance you cover compared with say, road cycling so I already knew that riding 107km was going to take most of the day. 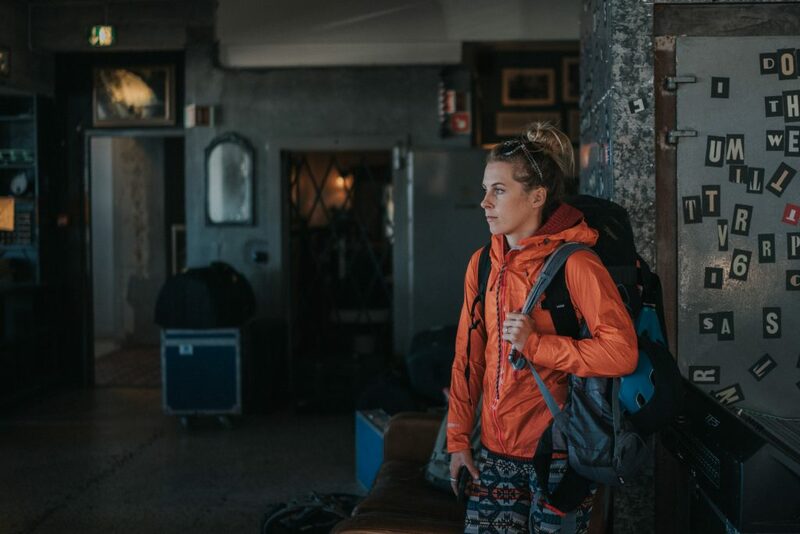 What I wasn’t prepared for was how tired I’d be after 50km, something made worse by the fact my supply of food and water had run out – I’d eaten and drunk everything by kilometre 40 as we’d been told to expect an aid station there. We eventually reached an aid station after around 55km and refuelled on a donated protein bar and soda as supplies had run out. Neither did much much to help us after we’d been running on empty and climbing a large part of the day. The remainder of the day was pretty painful – at points we were climbing at around 8km/p/h thanks to a savage headwind. After a wonderful evening spent in a hot spring, plenty of great food and a night in a tent, the following morning we were ready to rock again. We’d made it through a very dark moment the day before but rather than putting us off, it had actually made us think we could cope with anything. We’d been really blessed with the weather – it was warmish, sunny, dry, not too windy and the forecast predicted just a little rain. Pedalling away from our happy oasis we headed out along a real/tarmac road before turning off onto a gravel track cutting through the low lying brush and moss that peppers the region. After riding solo for much of the previous day, it was nice to fall in sync with a few of the other riders to chat a little and take shelter from the ever present (but not too bad) wind. Making good progress and still feeling fresh, I enjoyed the highlands of Arnavatnsheið, feeling quite content in the remote wilderness. Knowing that Day 2 included the most climbing of all, I made sure to keep it steady. The day featured numerous river crossings which I’d actually been looking forward to as it looked like fun hike-a-biking across Icelandic rivers! There were a couple of rivers that we could have ridden through but we prioritised dry feet knowing that the weather could turn at any moment in the Highlands and we’d have to wear the same shoes the following day. What followed were some fairly arduous kilometres moving quite slowly up gravelly climbs followed by the odd gravelly descent that would normally have been fun, but under the circumstances felt a little unnerving – the day before the race we’d signed papers stating we’d pay for our own helicopter should we need to be rescued and it’s hard to get that thought out of your head when you are on your own in the middle of nowhere. An accident could have catastrophic results! 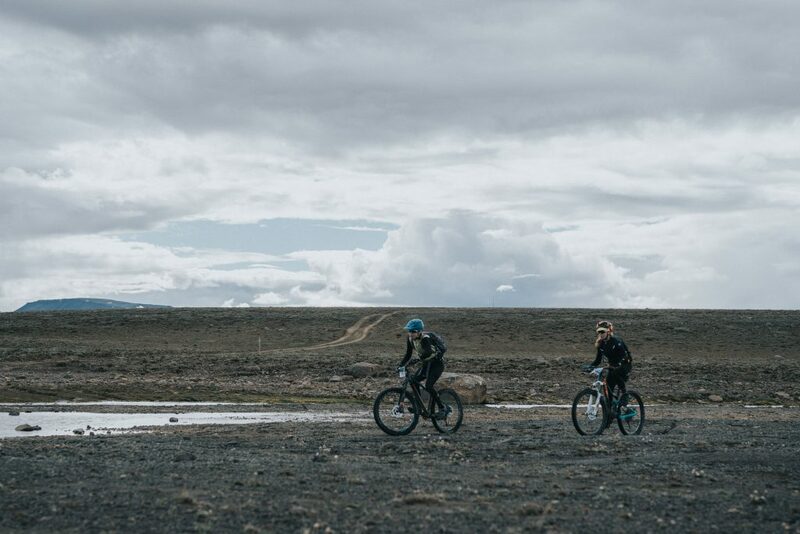 No matter how beautiful the landscape, after 100km we were mighty glad to dismount our bikes in Hveravellir, where natural hot springs and food awaited. As I lay in the sulphurous water later that evening, the fluffiest sheep I’ve ever seen ambled down to have a look at the new arrivals. We were achy, sore, sunburned and chapped but I felt like a goddam queen – what an enormous privilege to be bathing at Icelands highest point after a day riding my bike. 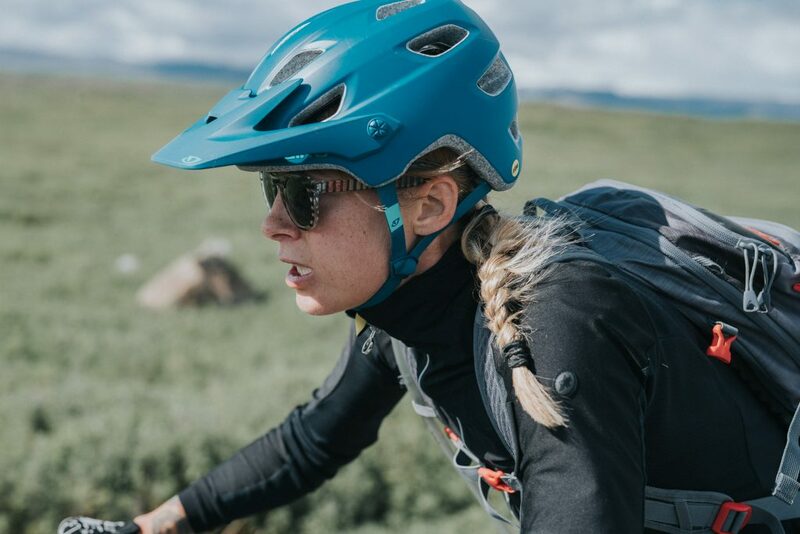 With Day 3 featuring the least climbing and promises of some flowing singletrack, I was excited to get back on the bike even though everything hurt. Up until that point, we’d mainly ridden gravel, sand and rocks and I was riding a hardtail (whereas most people had full suspension cross-country bikes) so it was no surprise my bum was hurting. I popped an Ibuprofen to deal with some knee pain and was happy when it went some way to soothing my other aches. 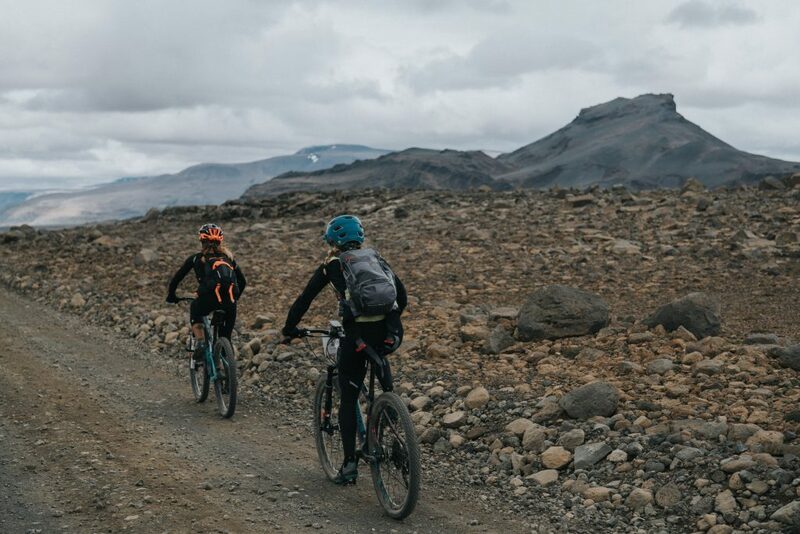 After a really fast start and climb, we reached a fun, technical descent (which I was able to enjoy by dint of it not being about 40km from a road) before we entered the most incredible valley, Thjofadalir or the Valley of the Thieves. Following a dirt path generally only accessed by hikers and horses, I couldn’t stop grinning as I sped through the lush valley, following a river that wound its way through this green, black and red landscape. This being our final day, we splashed our way through the river rather than dismounting, enjoying some flow and speed after a couple of slow going days. The tricky lava field successfully completed, we turned onto a gravel road for what I assumed was our last climb and plodding up the road, the summit line in clear site, I felt like we must be nearing the end of our journey. Kym was feeling really tired at this point but I assured her we only had to get to the top of this one hill then it would all be plain sailing. I was wrong. What followed was a soul destroying headwind and plenty of additional climbing that really tested me and after being really positive for nearly three days, I finally broke and decided I just wanted to be ‘there’ and that I actually hated stupid bikes. Thank heavens Kym got a second wind and let me sit on her wheel for the last 10km. When we rolled into Gullfoss I felt elated. 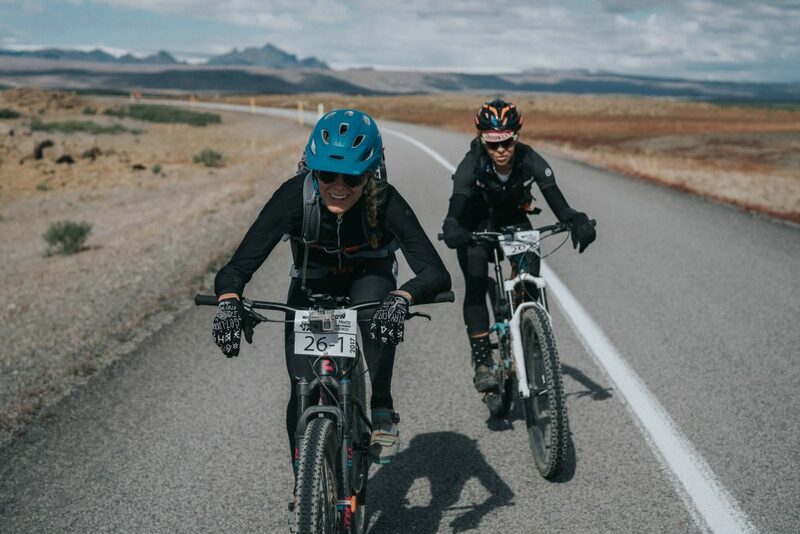 It was my first multi-day race and Kym’s first mountain bike race, w’d battled through some really tough moments to finish an event than many had been unable or unwilling to complete. We’d even finished Third! What an amazing adventure. You two rock! Congratulations!! thank you, it was incredible. That looked epic Juliet, thanks for sharing. I’ve just bought my first Mountain Bike, (50 year old going through a mid life crisis thing) and was wondering about shoes. I noticed from your previous vids you don’t wear spds. Is that the way to go? I do some weekend road bike stuff so am used to clipless. Obviously looking to start slow and do trails and maybe some bikepacking. That’s great you just got your first Mountain Bike, I hope you’re having a great time riding it. I do wear SPDs when riding cross-country (in fact I am wearing them in this video). I just don’t wear them for Enduro/Downhill/technical stuff. I’d definitely recommend them for trail riding. Giant respect for your performance. I have already written this race on my agenda. Just hope I’m not too old for it (55). 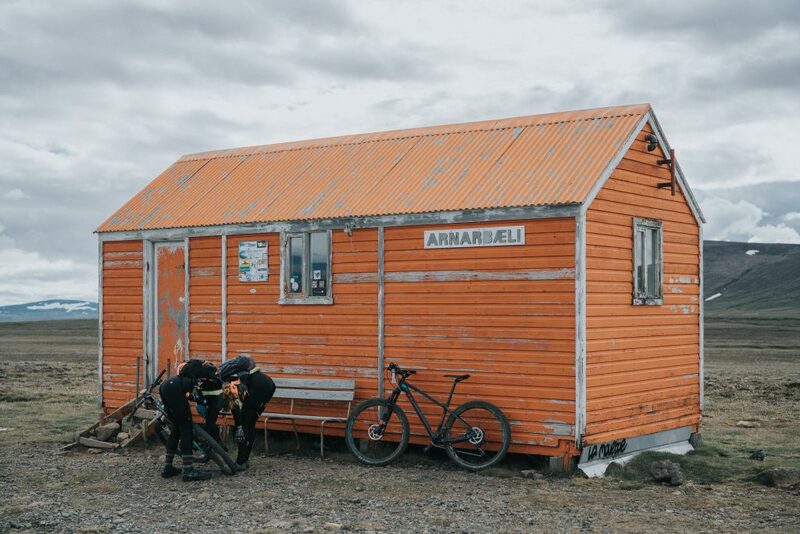 How does the bicycle transport to Iceland actually work? Can you recommend an airline for that? Awesome to hear you will compete next year, have a great time.